Gendered Citizenship will be valuable for advanced students, researchers and scholars of political science, history, sociology and gender studies. It would also be helpful to those studying social exclusion and the general reader interested in debates over gender and citizenship. Categories: Education, Gender, Orient BlackSwan, Politics, Publisher, Reference, Social Sciences, Sociology and Anthropology, Women's Studies. 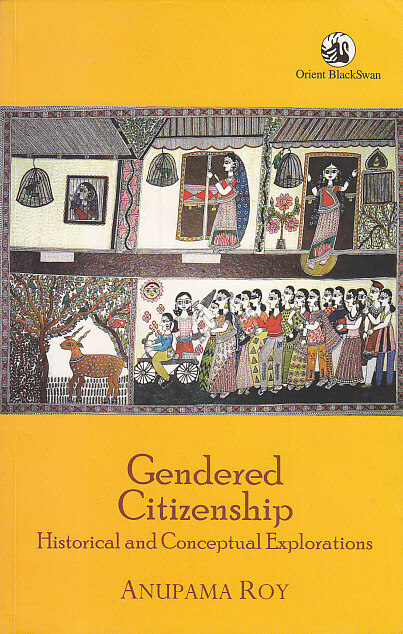 Tags: History, 9788125047643, Anupama Roy, Gender and Citizenship, Gender studies, Political Science, Sociology. Through successive historical periods, ‘becoming a citizen’ has involved a gradual extension of equal membership to more and more persons and groups. However, the promise of equality masks the exclusionary framework of caste hierarchies, gender differences, and religious divides, which determine actual experiences of citizenship. Historically, citizenship was constituted through a series of exclusions whereby large sections of people, (colonised societies, slaves, women and workers) were considered inadequate for it. Citizenship is therefore made up of multiple margins, but it also releases powerful new imaginaries and practices of citizenship. This revised edition of Gendered Citizenship (first published in 2005) examines the gendering of citizenship. In the context of resistance against the colonial rule, the language of citizenship that emerged in late colonial India was based on a gendered notion of the community—both national and political. Pulling in arguments on how the Indian Constitution transformed the idea of citizenship, it teases out the plural sites of citizenship which existed at this moment, and traces the forms in which idioms of citizenship endure in contemporary times. It explores in particular the landscapes of new citizenship which have emerged in the form of flexible citizenship with graded entitlements, as distinguished from spaces of stable citizenship. It proposes that a concerted effort towards an interactive public space can congeal into shared bonds of citizenship.